I don’t know if I was attracted by the red colour of the packaging or if the products being right there, in my face, as I entered was fate doing it’s thing. Either way, I got a few “young solution” products and, thus far, I have no complaints. I wash up with the Triple Action Face Wash, tone down with the Oil Controlling Toner and my “Dove” cotton wool pads and, to end with, I take control with the Mattifying Anti-Spot Moisturiser with SPF15. 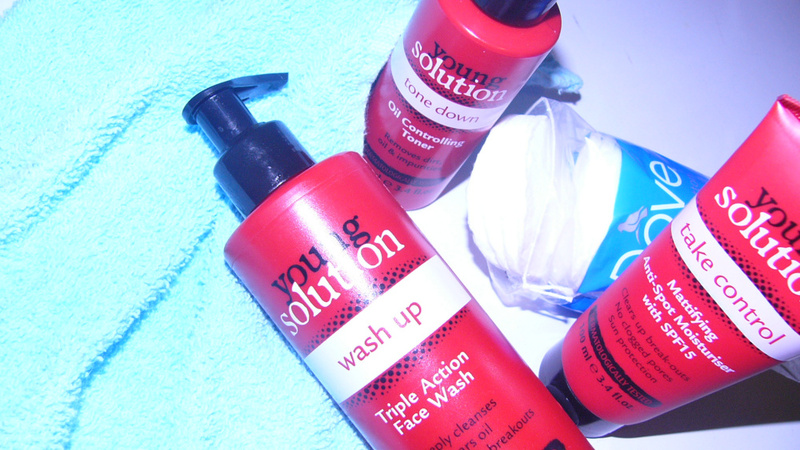 I got a few other products from “young solution” that I haven’t used that I won’t mention. To be fair, those products are not for daily use, thus it would be unfair to include them right now. In a later skin update post, I will include all the products and give a review of how they are all treating my skin. In addition to the new products, I am trying to eat a liiiiiitle bit healthier – I’m taking one step at a time – as well as drinking more water than I used to. An overall healthy life will, hopefully, lead to a healthy body and healthy skin. Here’s to clear skin in 2018.